Exactly six months to the day before the Non-Stop Picket started, the City of London Anti-Apartheid Group led a spectacular protest outside the South African Embassy in Trafalgar Square. On 19 October 1985, three hundred and twenty-two people were arrested for blocking the road directly in front of the Embassy. In the weeks preceding the demonstration, City Group had circulated a call to surround the South African Embassy. 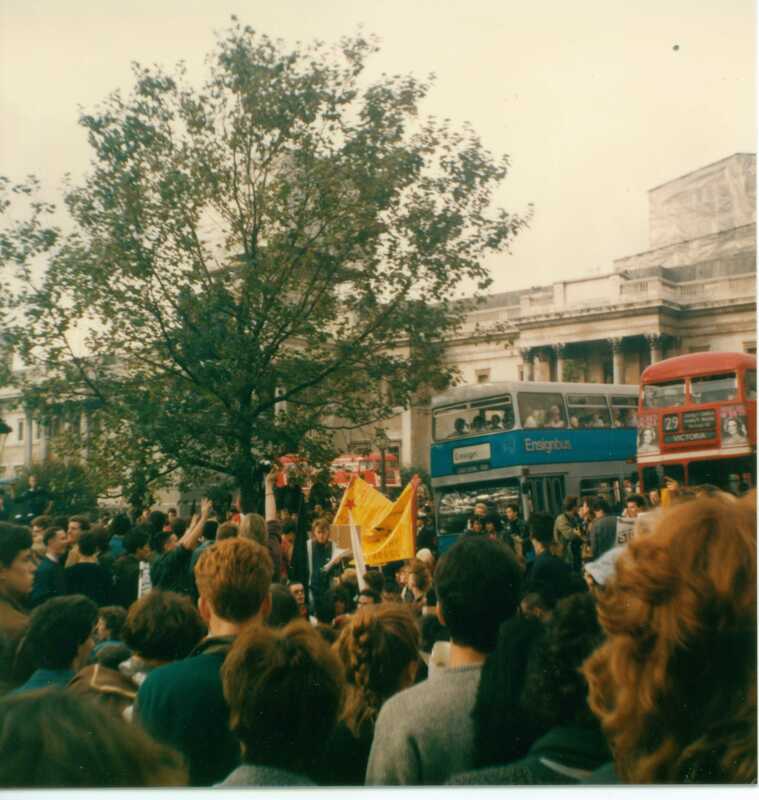 On the day, City Group’s numbers were swollen by students participating in a National Union of Students [NUS] demonstration against apartheid in Trafalgar Square. It is not clear from the material currently available to us whether City Group or NUS called their demonstration first. It is likely that the two events were called independently, but with the two events (almost) co-located City Group offered students a more militant option for protesting against apartheid. Certainly, over the course of the afternoon, hundreds of students relocated from the centre of Trafalgar Square to protest directly outside the South African Embassy, and eventually blocked the road. It was not, however, City Group activists who played the crucial role in inciting the students to leave their static rally at the foot to Nelson’s Column to protest outside the embassy. It was actually women from the Greenham Common Peace Camp who took the microphone away from an ANC speakers and announced to the crowd, “if you want to fight apartheid, cross the road and join the picket”. Raw footage of the protest held on the ITN Archive site shows hundreds of young people blocking the road. Both the pavement outside the Embassy and the roadway itself are packed full of people. At the start of the clip, some are standing in the road, some are sitting. Two buses are caught in the crowd, prevented from moving. A familiar City Group chant is heard coming from the crowd – “Close down the nest of spies! Stop the murder! Stop the lies!” The camera pans and finds Amandla Kitson, improvised tambourine in hand, standing at the edge of the roadway energetically leading the chanting. As the police move in to make arrests and clear the road, student protestors make their bodies limp and are carried away. More seasoned City Group activists continue chanting for the release of Nelson Mandela as they are arrested and a legal steward busily weaves between the police trying to record the names of arrestees. The picket of Rochester Row police station continued that evening until all those who had been arrested (and taken there) had been released. However, the number of arrests was so high that City Group’s normal structures of legal support and solidarity were overwhelmed, with arrestees taken to police stations across London. Of the 322 people arrested that afternoon, only eighteen were actually charged. It should be noted that the success of 19 October, which was registered in the jubilation of almost all who took part (bar the police) was not just because we got it right on the day. In fact, at a certain level of assessment it could be quite self-critical of City AA’s performance on the day. Far too many of our people were arrested early on, leading to a shortage of stewards and organisers, for instance. But this would be missing the main point. We got it right on the day because the political conditions in Britain correspond to City AA’s overall approach and methods. 19 October was a vindication of our pushing forward and involving thousands in street protests, it was a sharp rebuttal to those who put themselves forward as leaders in order to stop the escalation of protests at all costs.. Those who are hostile to City AA immediately began to minimise its significance or leave out the fact that City Group organised the event. The 19 October events showed that direct action protest to close the Embassy is possible, is legitimate and can be extremely embarrassing to the British government and their racist allies, as well as to South Africa itself. Andy’s assessment seems correct – the sit down protest on 19 October 1985 demonstrated that hundreds of young people were prepared to take direct action and risk arrest in pursuit of the closure of the South African Embassy. Although City Group probably did not mobilise the majority of participants in the 19 October protest, it is clear the City Group’s vision of what anti-apartheid protest could be was decisive on the day. In the weeks after the protest, City Group activists went on the offensive, writing to the media (such as London’s City Limits magazine and Anti-Apartheid News) to assert their involvement in the demonstration and prevent NUS from taking the credit. Although the idea for the Non-Stop Picket had not been proposed at the time of the 19 October demonstration, I believe that events that afternoon helped consolidate City Group’s reputation for direct action against apartheid in a way that, six months later, would make the launch of the Picket achievable. On a more personal note, the 19 October 1985 sit down outside the embassy is important to me. It was the first occasion that I came into contact with City Group. I was fifteen. I am not sure if I knew that the protest was happening, I was mainly in the West End that afternoon to visit art galleries. On entering Trafalgar Square, I found a noisy, vibrant protest against apartheid and joined in. I sat in the road, chatting to students and young women from the Greenham Common Peace Camp until the police began arresting the protestors a row or two in front of me. At that point, I made a tactical retreat and watched, exhilarated, from the sidelines. It would be another seven or eight months before I returned to join the Non-Stop Picket, but that afternoon put City Group on my radar as people who were serious about fighting apartheid and with whom I felt an affinity. This entry was posted in Archival research, Gavin Brown, Interview material, Project staff and tagged City of London Anti-Apartheid Group, Direct Action, National Union of Students, Non-Stop Picket, Rochester Row Police Station, sit-down protest, South African Embassy, Trafalgar Square. Bookmark the permalink. Fascinating post on what must have been a very important day for anti-apartheid activism in the UK. Interesting how protesters from the NUS, Greenham Common and City Group all played an integral part, but the protest really spurred on the City Group. I guess the large number of those arrests (322!) must have confirmed a popular groundswell of anti-apartheid sentiment and the potential for the non-stop picket. But did the arrests also send out a signal that the police were going to be heavy handed in response to anti-apartheid? It would be great to hear about other accounts of pickets or actions involving South African embassies from across the globe. In 1975, Boycott Outspan Action targeted the S.A embassy in Amsterdam as part of their anti-emigration campaign. By handcuffing activists to the embassy railings the BOA staged the event with national and regional news agencies. Newspapers the following day displayed photos of a bemused policeman standing next to a sign attached to the S.A embassy reading “Danger, do not migrate to South Africa. Talk to black South Africa. Call the BOA”. I remember being arrested that day too, one of the highlights was being put into the meat wagon and hearing Billy Bragg singing “Chile your waters run red through Soweto” from the adjacent cell, it was a blissful moment of solidarity. Another incredible moment was one afternoon during the the non stop picket outside S.A house, Jesse Jackson’s coach pulled up and Jackson came right up to me to sign the AA petition. Nowdays, as a teacher , I often use my direct experience and participation in the 1980’s protests to teach peaceful civil disobedience. Gove how do you like that?